One way to play a part in conserving and protecting our environment is by consuming less energy daily. In relation to this, using a solar panel is highly encouraged. It is common misunderstanding that purchasing a solar panel is costly – what they fail to realize is that there are various affordable prices of solar panels. In the Philippines, various environmental organizations are consistently placing effort to convince citizens to switch into the sustainable lifestyle. Another way to do this is by investing in energy-efficient appliances. Join the movement and make your humble abode a more environment-friendly one. 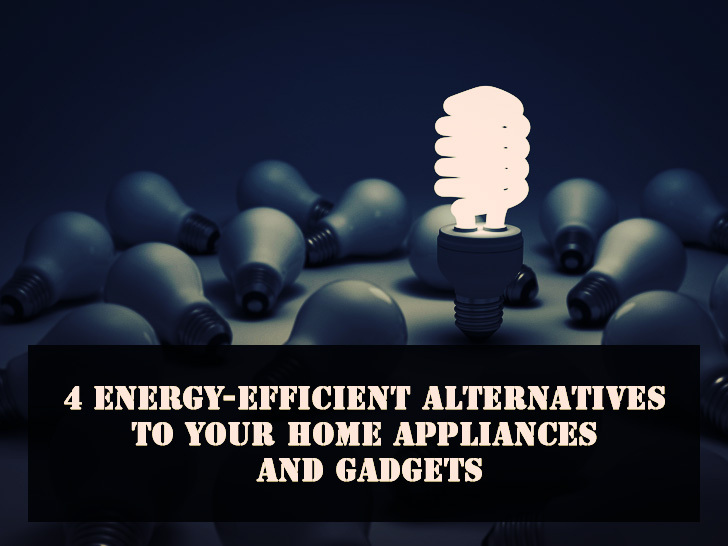 Ditch the energy-guzzling appliances you may currently have for these highly energy-efficient appliances that only use energy up to two to ten times less. Did you know that electric lighting makes up 25% of your household’s monthly energy consumption? Cut this down by replacing your incandescent bulb with CFL and LED bulbs. Compact Fluorescent Light or CFL is a small version of the standard fluorescent. This kind of bulb was designed to replace incandescent bulb and save more energy. Switching to CFLs will save up to 409 terawatt-hours per year and will minimize your carbon footprint. On the other hand, Light Emitting Diode or LED is another type of an energy-efficient bulb. LED bulbs can last up to 10 times longer compare to CFLs, making it a far more practical choice. This bulb only uses 2 to 17 watts of electricity. Before buying your LED light, estimate your desired brightness and choose between cool or warm light. A ceiling fan is a great choice as it has a wattage of 65 to 175. In comparison, the average electric fan has wattage of about 2000 to 3000, so it definitely consumes a lot more energy! Instead of a desktop, opt instead to use a laptop. It consumes 85% less electricity than desktop, making it the most energy-efficient choice. To save even more energy, turn off your laptop when not in use. You could also use one large power strip with individual switches, so you can plug the laptop and other appliances in there and turn it off as needed. This tip could save you up to 200 kWh per year. The refrigerator is essential in every household. Storing your food in a cold place will slow down the growth of microorganisms and prolong the life of your food. However, refrigerator takes up a huge portion in your monthly energy consumption. Consume less energy by opting for a single door refrigerator. Since it has a smaller freezer compared to a double door refrigerator, single door refrigerator consumes around 30% to 40% less energy than its two-door counterpart. Moreover, a single door refrigerator is much cheaper than the double door refrigerator. Hence, choosing a single door fridge will not only you save energy but money as well. The electricity consumption in every household is quite different from each other. Be aware of how much energy each appliance and gadget in your home consumes, and consider replacing them.